In this concise book on agile and Scrum, Betteke van Ruler offers an alternative methodology for project planning in the communication branche in which flexibility is embraced and formalized. Dynamics and change are no longer obstacles but simply elements of the method. Scrum was invented by two organization scholars and further developed in the IT industry. Today it is applied in many disciplines but scarcely at all in the field of communication. That is expected to change swiftly. Scrum is now being applied experimentally in communication, and users are highly enthusiastic (Public Relations Review). @bettekevanruler’s book on agile in public relations. Must read book, applied work in lots of areas. Do you give up trying to plan because as soon as you do it, it’s out of date? Do complicated planning models that look rather like central heating systems put you off? If so, perhaps it’s time to get agile. communication plans that languish in drawers (or more likely on an unvisited SharePoint page) are over – but because it is also written and presented in such an engaging way. Betteke explains agile and the concept of the “scrum” and “sprints” and tells us how to apply them. So what do these terms mean? Well, a scrum is where the team reviews progress and discusses what will be done before the next session. It’s usually held standing up and there is a scrum master (what a great title!). A sprint is a predetermined period during which actions are developed and implemented. Each sprint is followed by a validation meeting that includes the project owner and possibly stakeholders. This approach allows for much more flexibility and adaptability. With traditional approaches to planning, changing the plan as you go because the environment is changing can sometimes be seen as a failure to plan properly in the first place: surely we should have thought of all these things from the start? The reality of course is very different. We are often dealing with complex stakeholder demands and a fast moving business environment. I do a lot of communication on change projects and the projects themselves are changing all the time. Scope can change, new stakeholders emerge, all sorts of things impact on what you are trying to do – most of which could never have been anticipated. Unsurprisingly the result of this can be that people give up trying to plan altogether. And we all know that failing to plan is planning to fail. My one caution would be that if you adopt this approach, you really must embrace it. I have worked on change projects that have adopted the terminology but not the methodology – that’s straight to the naughty step in my book! Recently Eighteen04, a business incubator for clean technology startups in Newcastle, agreed to participate in a research project with myself and University of Newcastle Communication Honours student, Samuel Rooke, from the School of Design, Communication and Information Technology. 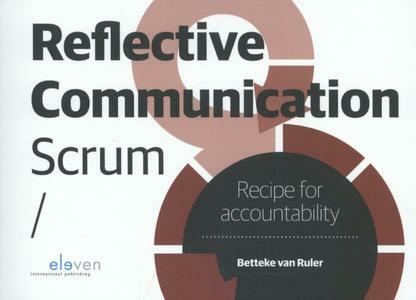 We are planning an action research public relations project that is using Professor Betteke van Ruler’s (2014, 2015) Reflective Communication Scrum (RSC) method. Scrum as a method for managing projects and workflows originated in IT and is now used in many areas, but only recently in public relations. I believe it shows great promise in the strategic communication and PR space and Sam and I presented on the method and the Eighteen04 planned project to Newcastle’s Professional Communicators’ Group at the end of April. Eighteen04, being a dynamic organisation providing co-working spaces and support to clean energy technology startup companies, was asked to be involved because of the synergies between agile methods such as ‘scrum’ and the organisation’s approach to business. Eighteen04 is aiming to be the Asia-Pacific hub for clean energy technology startup companies, and to further position Newcastle as the key city for startup ventures in Australia. 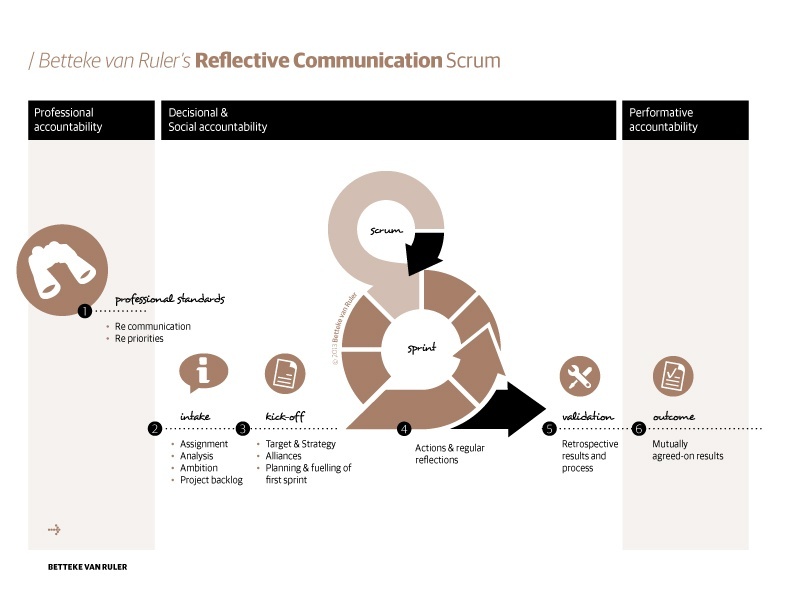 The Reflective Communication Scrum (RSC) method appears to be a good fit for Eighteen04’s public relations needs as it accommodates unforeseen dynamics and obstacles in the method, which traditional PR planning methods do not. Both researchers and Eighteen04 members will be involved as needed in the project Scrum team as required as this team needs to be self steering, and multidisciplinary, in line with the RCS method. Eighteen04 has nominated one of their co-founders, Mr James Giblin, to work in the Scrum method role as the Project Owner and he has agreed to be actively involved in and committed to the project. The aim is to get things done in the shortest possible time. It is planned on having Scrum meetings to determine what needs to be done and evaluate what needs to be done next; then a Sprint period of 2 weeks when agreed actions are undertaken; then the team Scrums again. Daily check-ins ensure work stays on track with potential and actual blocks to progress being identified and addressed as early as possible. We’re planning to have the student researcher, Samuel Rooke, embedded in the Eighteen04 workplace located at the CSIRO Energy Centre 3 days a week over several months this year. This project will involve him implementing communication strategies and tactics under my guidance together with reporting and reflecting on the process and experiences of using the RCS method. I’ll be presenting our project design process in a paper to the International PR Meeting in Barcelona, Spain, on 29-30 June 2016 to international scholars and we are looking forward to getting their feedback on our work to date. It’s wonderful that Professor van Ruler has agreed to be my “distant mentor” on this project and we are planning to meet at the Bledcom conference to be held in Slovenia in early July, where I am co-author on a paper with UON academic and PhD student, Andrea Cassin. van Ruler, B. (2014). Reflective Communication Scrum. Eleven, The Hague. van Ruler, B. (2015). Agile public relations planning: The reflective communication scrum. Public Relations Review, 41(2), 187-194.